The new system features a gamma camera system with a high-resolution detector; a fast, mobile and low noise electrical movement of the detector and a self-supporting crane stand construction. This replaces the previous scintigraphy system, the first totally digital camera for horses in Australia, which has reached the end of its lifespan. Image: Advanced imaging technician, Tanya Puksmann, scanning Angelo using the new scintigraphy system. The first case imaged with the new system was with Angelo, a gelding with a hindlimb lameness that was unable to be localised in the usual way with nerve blocks. Scintigraphy, allows large areas to be imaged and is therefore very useful for localising pathology. In this case we imaged the spine, the pelvis and both hind limbs. The gamma camera detected evidence of disease in the horse’s sacroiliac joint (the joint between its sacrum and the ilium bones of the pelvis). Image: Equine surgeon and Head of the U-Vet Equine Centre, Professor Chris Whitton, analysing the scintigraphy scan of Angelo’s pelvis. 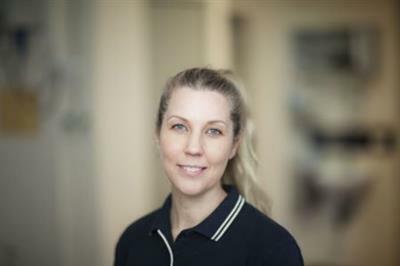 Tanya Puksmann BSc BAppSc(MedRad) who is dedicated to operating the system is a highly qualified advanced imaging technician has qualifications specialising in nuclear medicine had worked in both human and veterinary nuclear medicine and over 15 years’ experience in scintigraphy at U-Vet Hospital. Her level of experience and expertise will be extremely valuable in optimising the image quality. Scintigraphy equipment is highly sensitive and keeping it running smoothly and accurately requires substantial expertise. 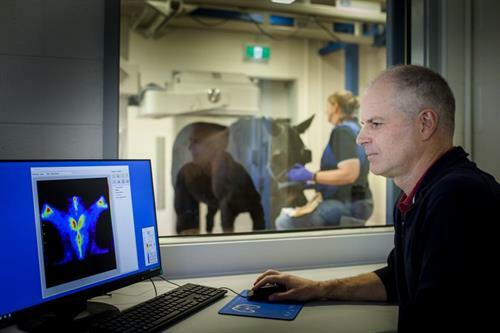 The system will be integral to the University of Melbourne’s Equine Limb Injury Prevention Research Program. Early detection of musculoskeletal injury is essential to preventing more serious outcomes and as scintigraphy is the most sensitive method of detecting bone injury this is where it excels. All horses examined at the U-Vet Equine Centre can benefit from the depth of understanding of bone injury in athletic horses generated by this world leading research team. 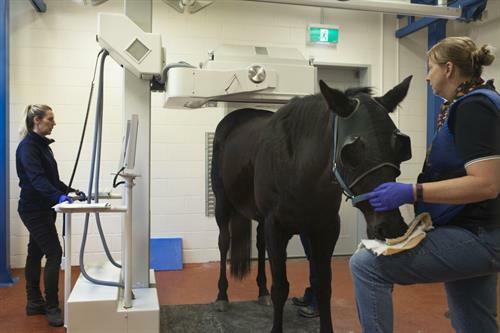 At U-Vet Equine Centre, we are able to perform scans on all areas of the body from the feet to the head. With over 15 years history of scintigraphy, we have accumulated a vast database of images with which we can compare each new case. Scintigraphy is especially useful for cases where the source of the lameness is difficult to localise, where the site of lameness has been identified but there are no changes on radiographs, where multiple sites of lameness are suspected and for problems of the spine, pelvis and sacroiliac regions. The horse is usually admitted the day before the scan and depending on results the horse is able to go home 24 hours post scintigraphy. Learn more about our diagnostic imaging, video endoscopy and pathology services, or contact us to find out more and make an appointment.